The subwoofer extends the existing bass below 80-120 Hz. Since our ears have problems in locating low frequencies, one subwoofer is sufficient in a stereo or home cinema set-up and doesn't need to be positioned in front of the listener. Most subwoofers have a built-in amplifier to allow the individual adjustment of volume and low bass equalisation. The subwoofer's driver(s) should have a solid basket, a rigid cone and a strong magnet. Alcone stands for aluminium cone and is a product range by RCM. The drivers feature a rigid cone and show, nevertheless, only a moderate resonance. RCM developed special subwoofer bass drivers that are in line with the latest technological advancement. The following Alcone subwoofers have a strong magnet ensuring highest possible precision in reproducing bass. The cone is extremely rigid guaranteeing bass without dissipated power. Audaphon tweeter, ribbons and woofer feature an excellent price/performance ratio. Ciare is an Italian producer of chassis. Ciare produces chassis that satisfy different demands: CH 250 is a fullrange with very high efficiency. Focal is a well known brand. Focal was founded in 1980 in France. Loudspeakes with W-cone and the reversed dome tweeter is a hallmak of Focal. Mivoc is well known for DIY kits with very good price performance ratio. Monacor International was founded in 1964 in Bremen, Germany, and has since grown to a company group operating worldwide. Their well-known brands offer an extensive range of products which includes 5,000 items from the most varying areas like PA technology, security technology, car HiFi, speaker technology, stage equipment and DJ equipment. Peerless, Tymphany’s world-renowned brand of transducers, was founded in Denmark in 1926. Peerless quickly became known as one of the foremost producers of speakers for the newly emerging radio market. Soon after with the advent of television, Peerless again led the way in sound quality. For over 80 years, Peerless has been designing and producing market leading components for the loudspeaker industry. Seas history starts in 1948. The owner of Radionette, Jan Wessel decided to start making loudspeaker units for his own production of radio sets. Seas is well known for producing speakers of high quality. Founded in 1970, Scan-Speak still resides in Videbaek, Denmark. The acoustic engineers adhere to the legendary policy of "Never compromise". Scan-Speak never compromises on the product quality, sound quality or pursuit of perfection in a given application. In 1996, nestled against the foothills of Taipei City, Tang band Ltd. was born. Tang Band was created with one overriding goal in mind; to make innovative, high quality speaker drivers. Vifa Loudspeakers are renamed to Peerless. 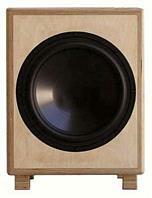 Visaton is a German loudspeaker manufacturer. With 30 years of experience in the field of acoustics and loudspeaker technology and a future oriented engagement in research and development, Visaton is nowadays a specialised and world wide successfully operating loudspeaker manufacturer. Wavecor is an innovative force in loudspeaker technology. High quality loudspeaker units for industry and personal customers (DIY) - for Hi-Fi stereo, multi media, home theater, pro, car applications, etc. Tweeters, midranges, fullranges, woofers, subwoofers. Evaluation kits. Complete car component sets. Complete OEM speaker system turnkey solutions for the industry. Since this magazine is targeted at the DIY market, every edition features loudspeaker kits, indispensable information for the DIY community. This loudspeaker DIY publication has a longstanding tradition. For many decades top-quality kits have been featured and off course the extremely popular Cheap Tricks (CT).